Photo Cutline: Grant recipients (front row, left to right) Dr. Sean Herlihy, Elizabeth Larakers, Mark Secord, and Kathleen Cuyler were honored by members of the CBC Foundation Board of Directors (back row, left to right) Shambryn Huie, Claire Atkinson Wonders, Bridget Gayle, Jim Kirkpatrick, and Laura Fischer at a college-wide meeting in November 2013. Also on hand for the presentation were CBC President Dr. Beatriz T. Espinoza, first row, far left, and CBC Foundation Executive Director Patricia Patel, front row, far right. 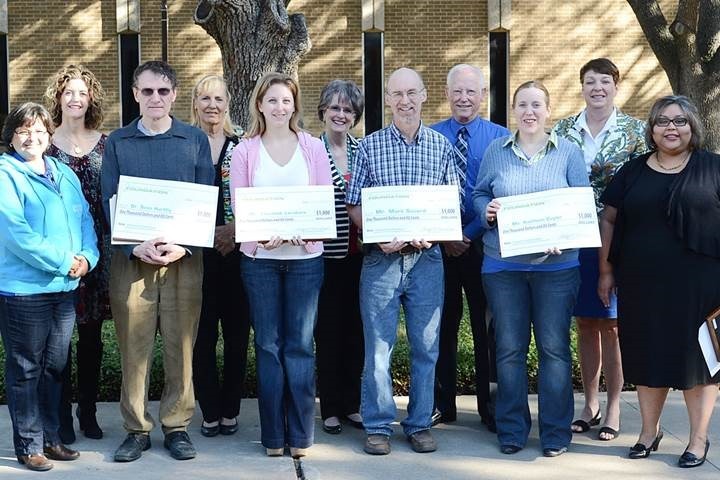 Several Coastal Bend College faculty members started the spring semester off with some extra funding thanks to the Innovative Teaching Grants sponsored by the Coastal Bend College Foundation. These CBC faculty members were chosen for their forward thinking, student-centric ideas that will help increase student engagement and success at all CBC locations (Alice, Beeville, Kingsville, and Pleasanton). CBC Biology Professor Mark Secord will be taking his biology class viral by utilizing YouTube to upload short instructional videos to supplement his lectures/labs. Students will be able to view these videos from almost any computer or mobile device, which puts success literally at their fingertips. "Students often struggle in science courses due to weak science backgrounds, the abstract nature of the material presented, and the large volume of content-specific terminology they are required to master. Student success rates in many gatekeeper science courses are often low, so there is a well-established need to provide students with additional instructional resources," Secord said about his inspiration to go forth with this concept. "Plus, research has shown that 2-4 minute videos are more effective than those of longer duration." CBC Physics Instructor Dr. Robert Benson is currently working on developing a new physics course geared towards students in workforce programs. "I really like making physics accessible and this opportunity provides a way for me to break down barriers for students in workforce programs," Benson said. Benson stated that he should have the course developed by the end of the spring 2014 semester. Elizabeth Larakers, CBC English Instructor, hopes to strengthen CBC’s relationship to the community by integrating ethnographic research and service learning into English 1302. Student will plan, cook, and serve a luncheon (tentatively scheduled for March 2014) for local seniors (ages 70+) and conduct interviews in order to collect living histories. This research will serve as historical and cultural context to help students interpret "A Raisin in the Sun". "My students are currently reading the play that integrates with the project, and they seem excited! Some of them have family members that fall into the demographic for the interviewees, which generates a wonderful sense of community involvement," Larakers explained. Dr. Sean Herlihy, CBC History/Government Instructor, and Kathleen Cuyler, CBC Assistant Professor of English, are teaming up to help students master the art of writing for college-level courses. Students will be able to access answers to commonly asked writing questions via Blackboard. Students will also receive encouraging and supportive email messages inviting them to visit the Writing Center if they need additional help. The CBC Foundation will begin accepting applications for the next round of Innovative Teaching Grants in mid-spring 2014. For more information, faculty members can contact Patricia Patel, CBC Foundation Executive Director, at (361) 354-2447 or via email at foundation@coastalbend.edu.